Elevation: minimum 358 feet, maximum 383 feet. Area Habitat: open land 10.25%, forest 8.27%, wetland 27.01%, open water 54.69%. Open under statewide regulations for all hunting and trapping seasons, except North Refuge is closed Nov. 1 – March 15 and Duck Island Refuge is closed Oct. 15 – March 15, with the exception of October muzzleloader deer season. Deer: Open under statewide archery and crossbow seasons through Oct. 14 only. Open during October muzzleloader season; closed during December muzzleloader season. Open during the October youth gun season; closed for the December free youth weekend. Squirrel: Open from the third Saturday in May through the third Friday in June; and from the third Saturday in August through Oct. 14. Turkey: In spring, open for Youth-Only and General seasons; In fall, open for archery and crossbow seasons through Oct. 14 only. b) the area west of a line from the north point of the mouth of Fulton Bay to the south point of the mouth of Honker Bay, closed Nov. 1 - March 15. Boating is allowed but hunting is prohibited within 200 yards of the area surrounded by a levee and located between river mile 68.4 and river mile 70.4 Oct. 15 - March 15.
b) Beginning at Pryor’s Creek Light extending south along the western shore of Barkley Lake to the boat ramp at the end of Land Between The Lakes Road 204, then to the west side of the Cumberland River channel, marked with buoys, to river mile 73.5, then north along the west side of the Cumberland River channel, marked with buoys, to Pryor Creek Light. All other blinds within this described area shall be temporary. WMA consist primarily of islands in Lake Barkley with Duck Island maintained as waterfowl refuge. Fishing, boating and other water-related sports. The North Refuge is closed Nov. 1 - March 15 and Duck Island Refuge is closed Oct. 15 - March 15. 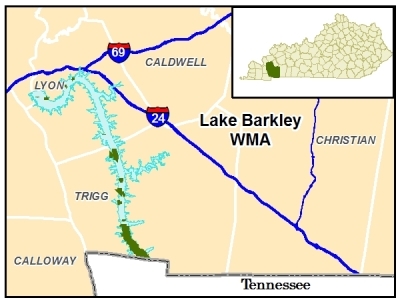 Lake Barkley WMA is owned by the U.S. Army Corps of Engineers.